Join us in a quest for the highest point in modern-day Yorkshire. Mapping and route data for this walk are available on our grough route system. This includes the route, profile, timings and other information, which can be customised to your own fitness levels. Key in Whernside to the route search. Note: grough walks should be used in conjunction with maps, a compass and other navigational aids. Routes often use open access land and involve finding your route off footpaths. Knowledge of and competence in using a map and compass are essential when using the routes. Carry the correct equipment for the conditions and be aware of hazards in the outdoor and upland environment. This route requires a good level of fitness. Only undertake it if it is within your capabilities. England’s biggest county can claim a few records: the highest pub in the country at Tan Hill; the highest sea cliffs on England’s east coast at Boulby, near Staithes, where they tower 200m above the sea; and, of course, Yorkshire was chosen as the venue to celebrate the opening of the country’s first national trail when Malham Moor was the site of the April 1965 gathering to declare the opening of the Pennine Way. But when it comes to the heights of its hills, Yorkshire’s record books can be a little confusing. Yorkshire, and its three former Ridings, changed substantially in 1974 when large chunks of it were ceded to Lancashire, Cumbria and Durham, and a now defunct Humberside. So the hill that was formerly the county top, the 788m (2,585ft) Mickle Fell, suddenly found itself in County Durham, and the West Riding’s highest ground, Whernside, took over at the top of the table as Yorkshire’s highest fell, its 736m (2,415ft) summit the highest point in the Broad Acres. Now, Yorkshire finds itself divided essentially into three administrative counties: North Yorkshire, West Yorkshire, South Yorkshire plus a unitary authority called the East Riding of Yorkshire, which is considerably smaller than the old riding. Confused? You’re not alone. The highest point in Yorkshire is a muddled place, as we will see. 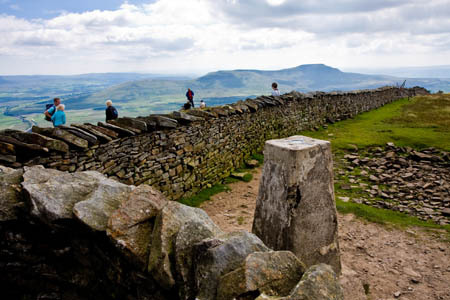 Whernside, as well as being the roof of Yorkshire, is also the highest of the Three Peaks, the neighbouring fells that make up the 39km (24-mile) challenge walkers aim to complete in 12 hours or less. Less shapely than Ingleborough and Pen-y-ghent, its whaleback bulk nevertheless shares its geology with the two other mountains. 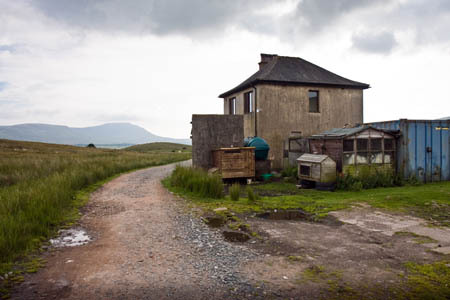 And, for the discerning walker, it has plenty of charms and a great view westwards from its summit. 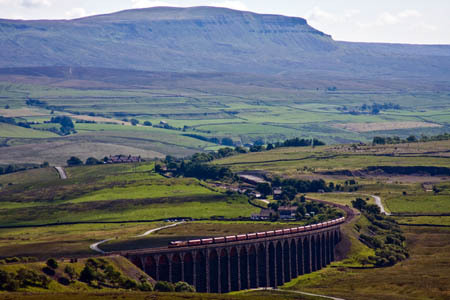 Our route starts at Ribblehead, the settlement that consists of a pub, a station, a few former railwaymen’s cottages and a quarry plus, of course, one of the most majestically placed railway structures in England, the 24-arch, quarter-mile-long viaduct across Batty Wife Moss. On summer days, Ribblehead can be a busy place, despite its lack of habitation, but there are plenty of lay-by spaces near the junction of the Ingleton to Hawes road with the Horton in Ribblesdale road, near the seemingly ever-present burger van. The moss was once home to a large shanty town housing the navvies who built the railway and viaduct and traces of the buildings can still be seen. There are interpretation boards and the Yorkshire Dales National Park Authority also has a podcast to guide walkers round the site. There are also extensive cave systems around Runscar and the surrounding moorland. Set off on the broad track leaves the Hawes road just east of the Station Inn and leads under the viaduct arches. Don’t take the path leading off to the right, which leads along the eastern side of the railway and which will be the return route. 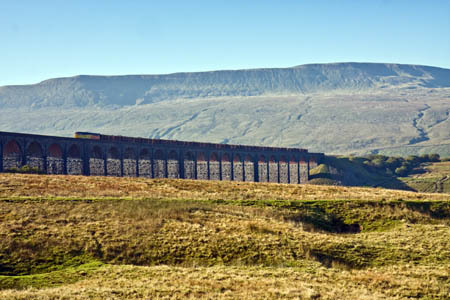 There are fine views of Ingleborough’s northern profile to the left as the track passes under the viaduct. The farm track passes through a gate and then skirts Gunerfleet Farm before crossing a bridge over Winterscales Beck. Turn right on to the narrow asphalt road with the beck to your right, then through another gate to the t-junction with the lane that leads from Winterscales to Ivescar. Turn left and follow the road for 100m, passing a group of large limestone boulders on the left. The next section involves a short trespass to reach open access land. If this troubles you, continue along the track, passing Ivescar and Broadrake farms to meet the main route to Whernside’s summit just short of Bruntscar. The route climbs the flank to High Pike before meeting the shorter route. This will add 3.8km (2⅓ miles) and about 1½ hours to the trip. 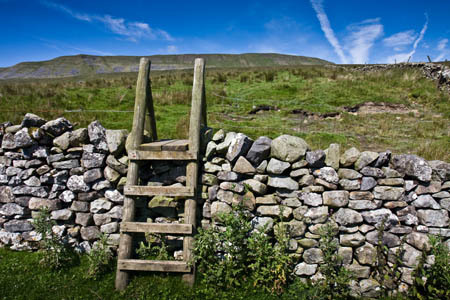 If following our route, use a stile to cross the wall to the right and follow the rough path leading up the moorland as it climbs Whernside’s southern flank. A small conifer plantation is met before a worse-for-wear stile allows the crossing of the next wall. 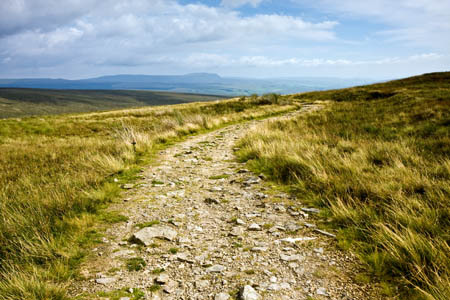 This route up Whernside was formerly the main ascent for walkers from the Ribblehead area, but was abandoned because of erosion and those heading for the summit of Yorkshire’s highest peak are now encouraged to use the longer alongside the railway and up Craven Way to reach the hill’s peak. Once past the plantation, you are on Countryside and Rights of Way Act open access land, and into a wet section underfoot. The climb is steady until a wall corner is reached near the final climb to the summit ridge. 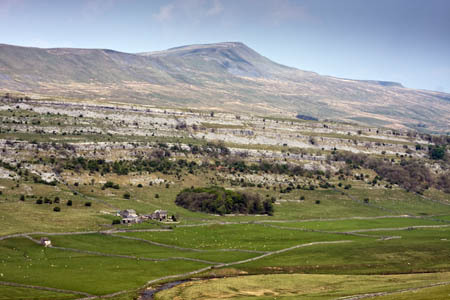 Pauses for breath and backward glances are rewarded with fine views of the now distant viaduct, with Pen-y-ghent forming its backdrop, and the full range of Ingleborough, Simon Fell and Park Fell. The route from here, keeping the wall and fence to your left, is eroded badly in parts and care needs to be taken on sections, particularly in wet weather. The relentless gradient finally eases as the ridge path is met. Turn right and follow the broad path up the gentle rise for 200m to the summit shelter, built into the boundary wall. The Ordnance Survey triangulation pillar is a couple of metres on the western side of the wall. Step through the pinch stile to reach it. In doing so, you will step out of Yorkshire and into Cumbria, the summit wall being the boundary between North Yorkshire on the East and Cumbria on the West. So, the marker for Yorkshire’s highest point is actually in another county! There is no doubt the highest point in Yorkshire is still on Whernside’s summit, but when the builders took their cement and aggregate to the hilltop to build the trig point, they didn’t anticipate someone forty or so years later someone drawing a line on a map would place their edifice in the newly created county of Cumbria. As you sit and ponder the conundrum, admire the extensive views to Morecambe Bay; Gragareth and Green Hill, the highest point in Lancashire; the distant Lake District mountains, the Howgills, and the northern fells of the Dales, including Wild Boar Fell, Hugh Seat, Great Shunner Fell and, closer at hand, Great Knoutberry, with Arten Gill viaduct at its foot. Sharp-eyed walkers will also pick out Blackpool Tower on a good day. 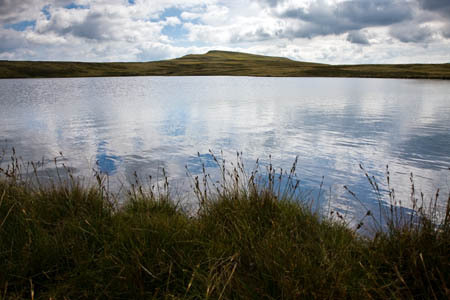 Then, with one small step, return to Yorkshire’s high ground and head north along the summit path, with the steep drop to the East leading to Greensett Tarn, probably one of the least visited in the Dales, despite being only 300m from the Three Peaks path. 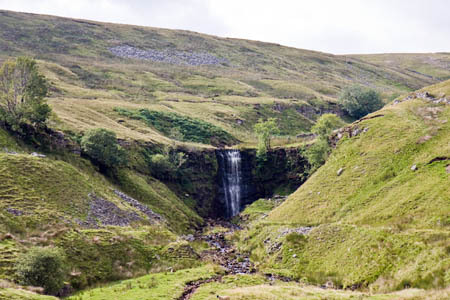 Alfred Wainwright had a route ascending beside Force Gill waterfalls and then diverting via the tarn before the steep climb up the fell’s eastern flank, but few take this route now, as the preferred, maintained path, complete with stone flags, leads north and west of Greensett. The ridge path starts to drop down and Whernside Tarns, the next objective, appear ahead and to the left. Look out for a newly installed stile on the left and head north to the collection of small tarns that sit on the shoulder of the hill. Depending on recent rainfall, some of these may be almost dry, but at least two of them provide a pleasant, if windswept, stop for lunch. 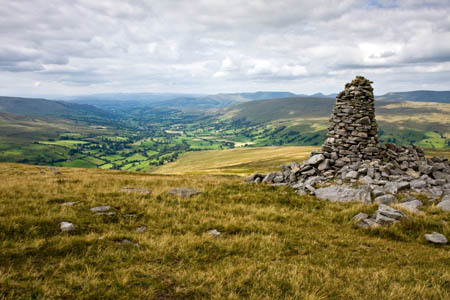 There are fine views – on a good day – to the Howgills and, backwards, to Whernside, its profile now wedge-shaped. Wainwright wrote that the sand from Whernside Tarns’ shores were much in demand for scythe sharpening – a practice that must now be a rarity. After taking in the solitude of the tarns, head north-west to the cairn on Pike, overlooking Deepdale and Dentdale. The cairn is now a little tumbledown and has obviously deteriorated since the curmudgeonly fellwalker drew it in his Walks in Limestone Country. But the view is still as impressive, with Great Coum, Middleton Fell and Gragareth gracing the near skyline, with the Howgills, Lakeland fells and the broad valley of Dentdale laid out below. A grassy path leads along a contour to the next cairn, and then the path is followed further round the shoulder of the hill to a tumbledown low shelter. From here, head downhill to pick up a broad, if boggy, grassy track to meet the wall corner and continue downhill, with the wall on your left, to meet the more obvious track of the Craven Way. Great Knoutberry is ahead in the distance, with an occasional train rattling across Arten Gill Viaduct at its base. Turn right along the Craven Way. The track is in parts stony and grassy, but the route is easy to follow, though vehicle tracks indicate you may occasionally meet an off-roader or trail biker. Pass a derelict building on the left and continue round to the right, Whernside’s summit eventually appearing again in the distance. On the hillside to the left, the spoil heaps surrounding the ventilation shafts of Blea Moor Tunnel can be seen, with the white trig point visible in good weather on the broad summit plateau above. The Settle and Carlisle Railway curves 150m (500ft) beneath the moorland here – through the longest tunnel on the route at almost 2.5km (1 mile). The tunnel was constructed by sinking shafts from above and cutting through the hillside at seven points and the existing ventilation shafts and their spoils are the legacy of this work. Continue along the Craven Way, once the main route between Ribblehead and Dent, and still the shortest, eventually joining the main footpath from Whernside on the right. Follow the track downhill, with Ingleborough’s bulk ahead in the distance and Force Gill waterfall appearing on the right before the track meets the railway just below the southern tunnel portal. The path crosses the railway in the company of an aqueduct carrying Force Gill Beck and then runs parallel to the beck and the railway for a kilometre or so until the lonely signalbox and its nearby house are reached. Blea Moor Cottage is currently home to John Myerscough, known locally as Hippo, a reclusive character who was recently ordered to clear from the area around his house two shipping containers, a caravan, five disused oil tanks, a small digger, a cement mixer, various tyres and wheels, and a large pile of household waste which included a sofa, two wardrobes and a television – an order with which he complied. The final two kilometres are completed in the company of the railway, the path eventually giving a grand view of the sweep of Ribblehead Viaduct – its former name, Batty Moss Viaduct, seemingly now abandoned just as the numerous hovels that once stood at its foot have been. The siren call of the Station Inn may now call, especially if the layby chuck wagon has packed up and gone home. 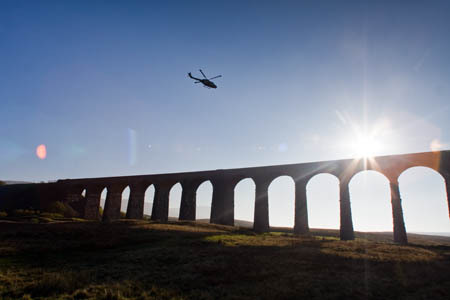 Car-free walkers can use the Settle and Carlisle Railway to access this walk, via Ribblehead Station.